was sagt er über evtl. preis..ist bei mir ist dass video so leise ? 2000,00 ? 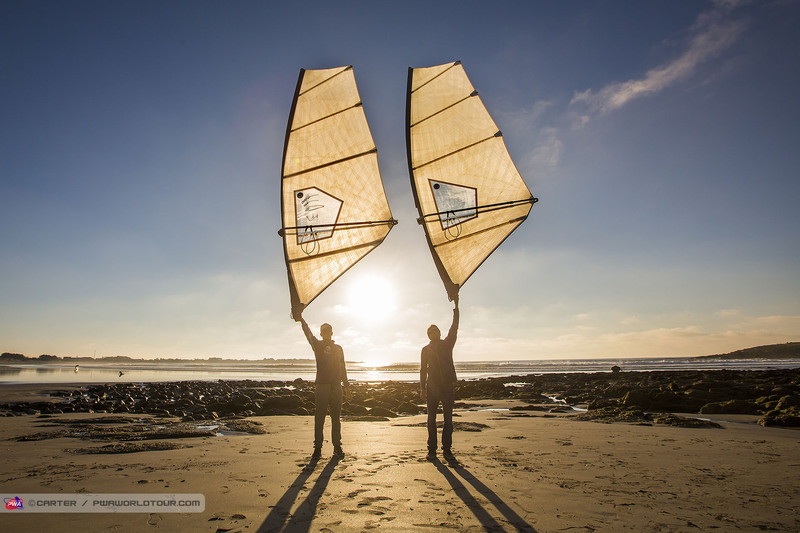 With the light winds continuing on Day 8 of the La Torche PWA Grand Slam we caught up with Raoul Joa and Klaas Voget (Fanatic / NorthSails / MFC) to find out more about NorthSails’ new moulded sail which they are currently developing. Raoul Joa and Klaas Voget Joa has been involved with NorthSails for the last 25 years and is heavily involved in all aspects of the company — namely as their product and line manager as well as also being involved with marketing — and with a wealth of experience he is the driving force behind the company. PWA: Can you tell us a little bit about the new sail you are currently developing? The technology you are using? and how it compares to what else is already available on the market? Raoul: “We call it a concept series because it’s going to be very limited in terms of quantity. It’s going to be a very expensive product, so it’s not a product for the masses - at least not to begin with. However, it’s important to understand that this is not a marketing ploy as the technology is proven as we are using the same technology as NorthSails use in their America’s Cup racing sails. The technology is called 3Di and has had millions of pounds invested in its development. This is a progression from 3DL technology, which was invented 10-15 years ago. At this time our racing sail — the IQ then — was made using this technology. Nowadays there are several brands that have sails that look very similar to this 3DL technology. This technology is called membrane technology — basically it is a 2D version of 3DL. It’s not a 3-dimensional mould, so it is a flat sail where the shaping is put in, in a traditional way (over seams). This is still a high-tech product, but NorthSails discovered some disadvantages with this technology even with the 3DL version, which is why we chose not to use this membrane technology because to create such a light sail you have to radically reduce the film thickness… This then creates a couple of problems. First of all UV stability is over proportionately related to the thickness of the material and as it is well known that polyester film is not UV stable. So over time insunlight the film becomes more brittle. This is why we choose to have a minimum 4mil of mono film in our current sails as we know this gives a good relationship between longterm durability, UV and weight. ON membrane or 3DL sails the laminate is reduced to 2mil or sometimes even 1.5mil in total thickness. A laminated film consists of two films and in the middle they have threads or yarns. With this technology where you have threads in individual directions and not in a pattern — they are individually laid up depending on the load directions, — this means there are a lot more threads running through the sail and this is what allows you to reduce the film thickness. This is the whole story of 3DL and this membrane technology that a couple of brands are currently using. 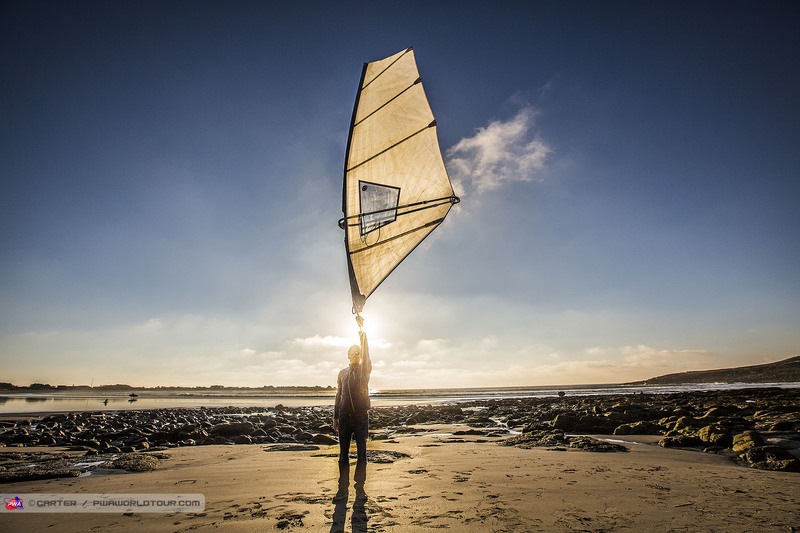 Secondly, in modern windsurf sails you want to have a low-stretch material. On x-ply and custom membrane sails it's always a combination of thickness and the amount of yarns. Unfortunately, the complete stretch is much more dependent on the film thickness than the yarns. When you radically reduce the film thickness you cannot compensate by simply having more yarns in the sail. If you reduce the film thickness radically, ultimately the sail will be very, very stretchy, which we don’t think is positive especially for performance sails like race sails for example. The easiest way to describe the 3Di technology, which we are exclusively using, is that it is a laminated sail. It’s made in exactly the same way as the shell of a board, as a windsurfing mast and a carbon boom for example." 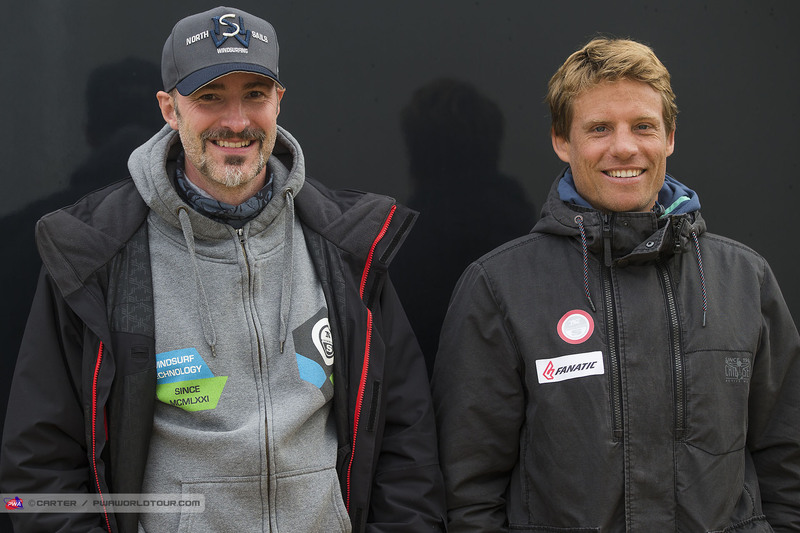 Victor Fernandez and Klaas Voget showing off NorthSails Windsurfing's latest innovation PWA: What is prepreg? Raoul: "Basically you put single fibre chords next to each other onto a piece of backing paper and then resin gets applied — the key here is that it’s a computer and hydraulic press controlled process giving precise control of how much resin goes into thefibres. The problem with this is you can only do this to a certain thickness because the fibre chords have a certain minimum thickness. At NorthSails Yachting they have developed a special process that is able to extract the single fibre hairs from each chord (each fibrechord consists of about 50-100 fibre hairs). Then with these singlefibre hairs, they are building a new prepreg, which is 50 times thinner than regular prepreg. Now because it is so thin it is becoming elastic, so when it’s combined with the specifically developed elastic resin it allows us to develop sails out of it. They then produce tapes of this thin-ply material. These tapes are thencomputer-laid on a huge table (the size of a football field because you have to remember that the technology was first developed for Yacht sails). This table is completely flat and underneath they have an array of tubes and strings. Hitting the enter button the hydraulics then transform the flat table into it’s £d-flying shape. It has been a nightmare for Kai Hopf as he’s had to learn a totally new computer language to design the sails. The beauty with being able to build the sail out of these individualfibre strands is that if there’s an area of the sail that we feel needs more strength, you can simply add more fibres to that particular area. So in the centre of the sail we have 2 or 3 layers but at the foot of the sail this is increased to 8 layers." Klaas Voget gives his feedback on the early prototypes: “My initial impressions are that the 5.0m felt super powerful and that the material delivers instant power, but on the other hand, once I was powered up I was surprised that I was not as overpowered as you would think. I think the material has quite a big range of use, but it is also still very early in the development stage, so we need to carry out way more testing. In Mauime and Victor will be testing a couple more protos and working together with Kai, who had learn the sail making from scratch for the 3D stuff. By giving him feedback we can control the exact shape of the sail and how many layers need to be used to reinforce certain areas to control the shape of the sail. On a traditional sail this would be done by using things like mini-battens or kevlar lines to control stretch. Now we can just apply another layer of this tape material and we’ll be taking it step-by-step over the next year or so.” Klaas Voget with one of the prototypes PWA: Weight wise how does it compare to what is already on the market? Raoul: “At North we strive to produce the lightest equipment on the market and we already have the lightest masts, booms and extensions on the market. At the moment our protoype is a similar weight to the Severne when it is dry. However, due to the fact that the batten pockets and all patches and reinforcements are allintegrated in the body, the only thing that takes on water is the mast sleeve, so our wet weight will be lighter. As I spoke about earlier you want a modern windsurf sail to have a controlled amount of stretch so that you get a soft power delivery. The problem with the 3DL technology is that when the film thickness was reduced the sails becomes very stretchy. However, with this new 3Di technology we are able to control the amount ofgive. We are able to design a sail that is elastic, but then stops stretching at a desired point and at the same time it is stiffer than a traditional sail. UV wise there is no more polyester film so it will be fine in the sun. The only thing we are unsure about yet it whether the white prototype may discolour, but we don’t know about this yet.” When are you hoping to have the first sails available to buy? Raoul: “At the moment we are hoping to have the first sailsavailable to buy around February 2018.” PWA: Thanks Raoul and Klaas. Ist ja auch noch ein Prototyp, oder? - in die Sonne legen -> einrollen -> "Falten- und Knickfrei"
noch etwas mehr infos zu den fotos möglich ? Sieht aus wie ein Holz(fuß)boden:D.
Wird gerne in der Formel 1 verwendet, da die Druckfestigkeit im Sandwichverbund überragend ist und eine zuverlässige Verklebung mit dem Laminat erfolgt. Nachteil: extrem anfällig für Feuchtigkeit, schon kleine Beschädigungen der Oberfläche können eine Totalverlust bedeuten. In der F1 wird definitiv kein Balsaholz verwendet. Die Holzplatten in der F1 sind sauschwer und Balsaholz wäre definitiv viel zu weich. Die können schreiben, was die wollen. Das Holz, das als Bodenplatte in der F1 verwendet wird, ist deutlich schwerer.